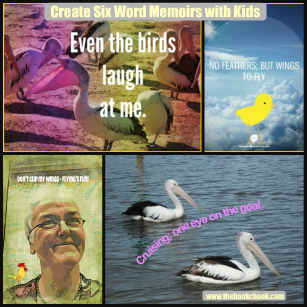 What I love about creating six word memoirs with kids is how versatile yet creative the project is. The idea of summing themselves up in six words doesn't daunt kids, yet they can learn a lot about writing tightly and packing punch into their work in the process. They'll develop visual literacy skills while presenting their work too, thinking about font choice, image choice and testing different ways to make images to communicate with an audience. For actual six word memoirs, take a look at Smith magazine which initiated a six word memoir project for its readers. And here's a digital book containing six word memories from third graders. Here's some writing advice from Teaching Authors. Enjoying and sharing the small things. The six word memoirs kids write can attempt to sum up their lives so far, or the way they want their lives to be. They could also just focus on one aspect of their lives. Some memoirs use metaphor. Others may simply be a list. The project might even be turned on its head and you could forget the words completely - have kids choose six images or objects that represent them. The main idea is for kids to express themselves and think about their own lives. In the memoir above, I played around with a self-portrait, while thinking about why I enjoy blogging. The sentence "Enjoying and sharing the small things." 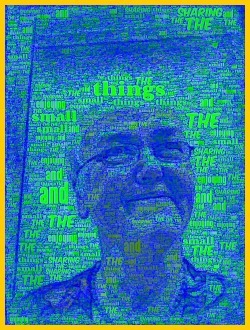 seemed to sum up my enjoyment so I went with that, and added it to my image in an app called WordFoto. 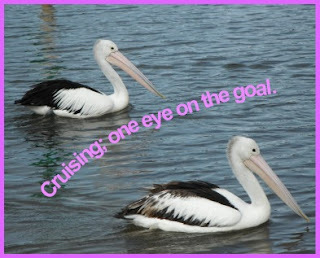 WordFoto is great, but I ran out of time to find an image that would not "lose" the text, as I did above. It's lots of fun to have kids think about how to publish their work. Digital versions can include very short video clips, images with captions, art work created on paper and scanned in etc. A class might choose to display all student's memoirs in a short slideshow (e.g. via PhotoPeach) and embed it on the class blog. Teachers might decide to stitch each student's image together using video software, and adding backing music and special effects. Or kids might choose to create a diorama or piece of sculpture to best accompany their work and display it in the real world, perhaps in the library or another safe area. Children need to think carefully about what their choice of background image will add to a digital memoir. Even small things like using a speech bubble or text box to display their text can make a subtle difference to the communication. If kids are not going to use their own artwork or images, then they should think about choosing CC licensed images for their project. Another reason I love this project is because there are so many apps and gizmos that can be brought into it to allow more choice. Kids might choose a comic editor to create their digital images and pop the text into a speech bubble. Adding a caption to an image is fairly simple with an online editor like Ribbit or PicMonkey, or kids could use Kerpoof or even PowerPoint. Some of the online poster makers like Big Huge Labs and Recite This enable adding captions to images too. If you have access to an iPad, you could experiment with apps like Percolator, Moku Hanga and WordFoto. I am increasingly enjoying this aspect of the iPad: that I can use multiple apps to change images, and tweak until I get an effect I want. 1. Top (Under the collage): I used iPad app, TypeDrawing to add text to a photo on my camera roll. You put in what you want to say, then draw on the screen with your finger to add text in linear or non-linear ways. 2. Next down: iPad app, WordFoto finally to add text to an image that started as a photo, then was altered in iPad app, Moku Hanga. 3. 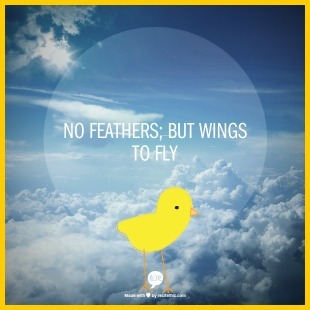 Next: I used Recite This to add text to one of their backgrounds, then framed and added a chicken at Ribbet. 4. 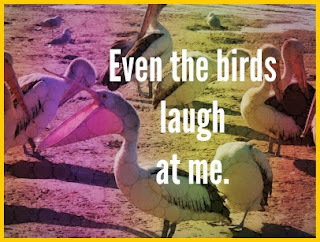 Last: I used iPad app, Percolator to add bubbles and coloured stripes to my photo, then added text with an iPad app called Over. Fast and Fun Writing with Kids, Get Kids Writing with Lists, Start Kids Writing with Fun Image Editors, Quick Writing Online, Visual Literacy - Investigate and Play with Images and Visual Literacy Activities with Online Resources. Love the six word phrase idea! It doesn't need to be a phrase. It might even be a list or two clauses. So long as kids are having fun playing with words, I don't think it matters too much! Love the idea pairing images with six-word memoirs, Susan. I'll have to try that in my young authors' workshops. So far, I've found six-word memoirs a great ice-breaking activity when working with young writers. Even reluctant writers soon get the hang of them. Yes, absolutely, Carmela. It's a great activity for reluctant writers. And it's a way to concentrate a little on that visual literacy that's so important nowadays!